Easy ways to overcome oily skin. I received a lot of comments and requests from you girls on how to overcome an oily skin problem. First, I want to let you know that I am not a professional. But still, it wouldn't hurt to share some information based on my own experiences and research that I got, and spread it with love with you girls. Right? :) So now let us take a look at what are the causes for oily skin. The first cause is from the production of Sebum which is the oily substance produced naturally on our skin. For example, imagine you did not wash your hair for a few days or weeks. You will feel a bit greasy and oily, right? That is because of the production of Sebum from your skin and later will affect you hair. Same goes to your face if you did not wash it regularly. Nutrition. The fatty and greasy food intake arealso one of the reason why our face turn into oily and greasy because it will produce more oil into the skin. Okay that is the basic things about what are the causes for oily skin. Now let us look at how to overcome the problem. It is very easy, all you need is a self-discipline. Always wash your face using a suitable facial cleanser twice a day (morning and night before off to bed). Choose a cleanser that is 'oil-control' formula. After cleansing, dry your face using only a clean towel, tissue paper, or cloths. Just make sure it is CLEAN. Because a dirty cloths contain germ and bacteria. You definitely don't want those germ transfer into your face, right? Avoid fatty and greasy food such as fried chicken, french fries, and etc. I know it is delicious and yummy! But if you want to take care of yourself, do not eat any of those things. Drink a lot of mineral water everyday! It is very important for your body and skin improvement. Did you wear makeup? If yes, make sure to clean your face and wash off all the makeup before you're going to bed. And also don't forget to clean your makeup sponge and brush often. Again, we don't want those germ to get on our skin. Very easy, right? If you have a high budget, and you want something extravagance to improve your skin and remove all those oil, you can always go for facial spa treatment. It feels very relaxing and in the same time can help you release stress. But as for me, I prefer a homemade facial spa treatment. There are a lot of ingredients that can be use to improve your skin. But I like to used egg white, and tomato. Separate the egg white and the egg yolk. Only take the egg white and stir it until you see a bubble in it. Clean your face from any products and dirt. Slowly apply the egg white evenly all over you face. You can use a finger or a cotton pad. Avoid eye area. 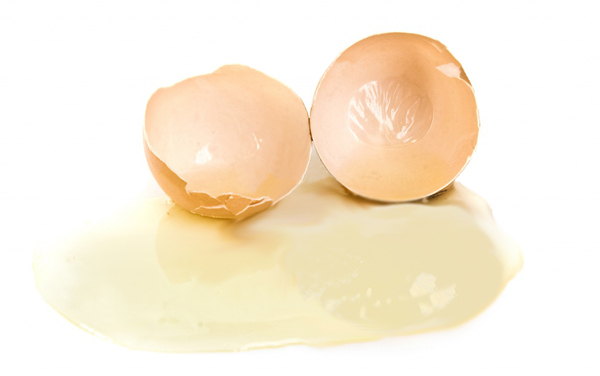 Wait until 5 to 10 minutes for the egg white to complete dry. You can feel your face is starting to become really hard when it is dry. Slice the tomato into a wedges or a small pieces. Put it into the blender, pour a bit of water and blend it. 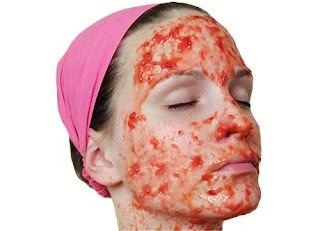 Make sure your face is clean, then apply the tomato evenly on your face (see the image above). Wait 10 to 15 minutes for the tomato to really be absorb into the skin. And Rinse you face. FYI, tomatoes can help reducing the pimples, remove oil, and remove dead skin cell on the face. telur putih tu selalu gak guna kdg2 (: nice. thanks for the information akak . Assalamualaikum, sy nak tnya kalau kita guna pencuci muka pahtu nk try cara yang awak bagi kat atas tu, boleh tk? ada effect apa2 tk ?